A statue of Nelson Mandela, who led South Africa’s transition from the apartheid system of white minority rule over the majority black population, was unveiled at U.N. headquarters in New York, and delegates addressed a “peace summit” to elevate his memory in this year’s centennial of his birth. “Few people in the history of our world have left such an incredible mark on humanity,” U.N. General Assembly President Maria Fernanda Espinosa Garces said at the dedication ceremony of the life-sized sculpture of the prisoner-turned-president. Shortly afterward, President Donald Trump arrived in the building, making a brief appearance at a separate event on fighting the global scourge of illegal drugs. Some 130 U.N. member states signed a U.S.-sponsored declaration to step up action against the narcotics trade that has left 31 million people around the world requiring treatment and is causing 450,000 deaths every year from overdoses or drug-related health issues. “Today we commit to fighting the drug epidemic together,” said Trump, whose administration is facing a rising tide of opioid addiction in the United States. He said the U.S. was taking “aggressive action” by securing its border, supporting law enforcement and devoting record funding to tackling the opioid crisis. There were only three speakers at the U.S.-led event that wrapped up within 15 minutes. 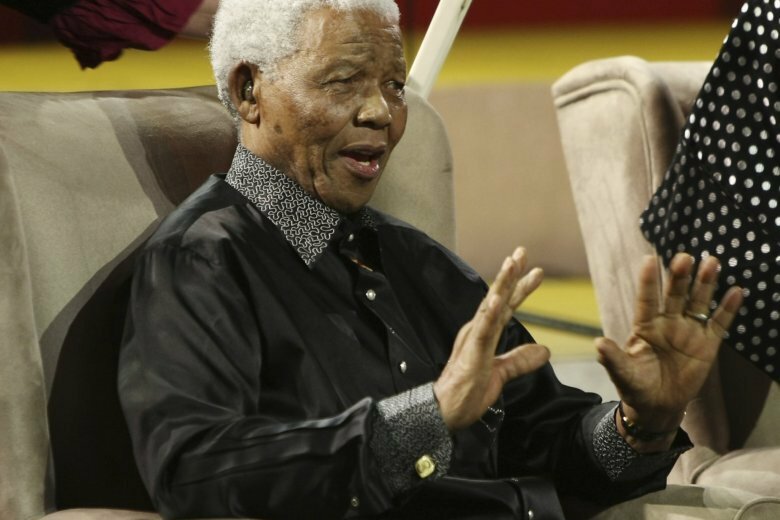 The peace summit was running much longer, with dozens of leaders from both rich and poor nations taking turns to hail the legacy of Mandela, who after his release from nearly three decades in prison became South Africa’s first black president in its first multiracial elections in 1994. Among those offering accolades was Iranian President Hassan Rouhani, who said Mandela had “sowed seeds of amity and compassion.” He appeared to draw a tacit, negative comparison with Trump. “This is a historical reality that great statesmen tend to build bridges instead of walls,” Rouhani said. Trump campaigned for office on a promise to build a wall along the U.S.-Mexico border. Iran is a bitter adversary of Washington, and those tensions have spiked since Trump pulled the U.S. out of Iran’s 2015 nuclear deal with world powers that had provided it with sanctions relief. The U.N. meetings take place against the backdrop of Iranian accusations that an unidentified U.S.-allied regional country supported a deadly attack on an Iranian military parade that killed at least 25 people this past weekend. But close U.S. allies are also continuing to express unease with Trump’s approach to international affairs. His administration has upended U.S. support of multilateral cooperation on everything from fighting climate change to participation in a U.N. human rights council it considers to be anti-Israel. Speaking to reporters, France’s top diplomat, Jean-Yves Le Drian, decried what he called Trump’s “mix of unilateralism and isolationism,” but added that’s no reason to snub Trump or lock him out of world events. This week, “is an important moment where each is expected to show whether they are playing together or playing lone horseman, whether they are seeking solutions or sticking to slogans,” Le Drian said. Trump is making his second appearance at the U.N. since taking office in 2017. He will address the General Assembly on Tuesday, when in an annual ritual of diplomacy, heads of government take turns addressing that forum on pressing global issues. He’s expected to redouble his commitment to “America First,” while shining a spotlight on the threat that he says Iran poses to the Middle East and beyond through its support for terrorism. Now Trump looks to Pyongyang as a diplomatic opportunity. He said Monday he will likely hold a second summit with Kim “quite soon,” to seek progress in achieving the denuclearization of the Korean Peninsula that he and Kim committed to at a summit in Singapore in June. Associated Press writers Edith M. Lederer, Jennifer Peltz and Angela Charlton contributed.